Gone to See America 2009 Road Trip. Day 16: Badlands National Park. 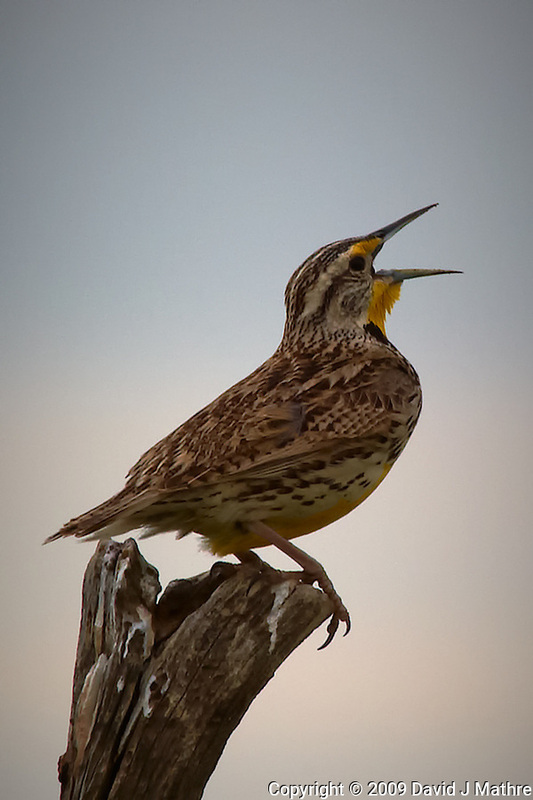 Western Meadowlark Singing. Late last night while not able to sleep after a loud spring thunderstorm, I started to read Moose Peterson’s book “CAPTURED — LESSONS from BEHIND the LENS of a LEGENDARY WILDLIFE PHOTOGRAPHER“. In the book I saw an image of a Western Meadowlark. This morning while driving to work I was listening to a chapter of the book “The Last Stand” on Sirrius/XM radio and heard that “Sitting Bull heard from a Meadowlark that he would be killed by a Lakota”. With two references to a Meadowlark, I remembered that I had taken an image of a similar bird while on my “Gone to See America 2009” road trip while in Badlands National Park in South Dakota. When I took the image, I didn’t know what type of bird it was, but was enchanted by its singing. Western Meadowlark, Badlands National Park, South Dakota. Image taken with a Nikon D3 and 80-400 mm VR lens (ISO 200, 400 mm, f/11, 1/640 sec).